Love was most definitely in the air last week – with restaurants hiking their prices up, wine rack pushing those bottles of Laurent-Perrier Rose out and the local florist’s becoming the new hedge fund traders! Put naturally with Valentine’s Day comes to apparent need for those in Love to express their undying passion for their partner via a poem! 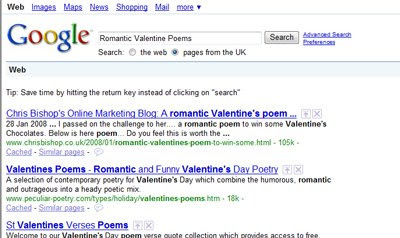 Now those who know me (and especially ex-girlfriends) can vouch for the fact that I am no sonnet composer however, those Googling last week for “Romantic Valentine Poems” will have found my blog post A romantic Valentine's poem to win some chocolates? You decide? sitting pretty in the number 1 Google SEO spot! This was in-fact a post describing the banter between Firebox.com Marketing Manager, Noami Brown and myself on affiliates4u.com for her to write a poem in return of chocolates! Included in the post was Naomi’s heartfelt :) poem. A year later and with no SEO effort the page now ranks numero uno! With the term and slight variances being the major driver to traffic to my blog in the past week. I imagine the affiliates reading this post would add, rather than solely having a nice natural link to Hotel Chocolat I should now amend this page to include affiliate links to various Valentine’s merchants for 2010 to ensure I clean up – to which I just might! Should brands engage in Twitter?